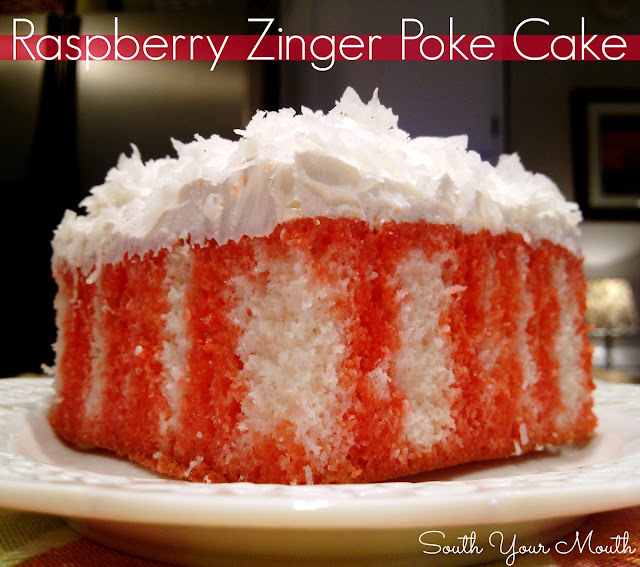 An easy poke cake recipe made with raspberry jello and coconut that tastes just like the Hostess Raspberry Zinger snack cakes. Yeah, OK, I know I promised to lay off of the coconut recipes because you coconut haters are over it but I just couldn't resist this one! There are several versions of this floating around and every time I see one I have the same reaction: salivating, lip smacking and head nodding while thinking something along the lines of... gurl, I got to get me some of that... umm-mmmm... yes. I. do. If you have no idea what a Raspberry Zinger is, it’s a snack cake made by Hostess. It’s a little baby cream-filled white cake coated with raspberry goodness rolled in coconut. And this cake is like its granddaddy. Bake cake per manufacturer’s instructions for a 13x9 pan. Cool cake completely in the pan. Poke holes in cake using a serving fork, skewer or whatever gets it done (try not to use a regular fork if the tines are pretty close together because it might tear up the cake too much). Mix gelatin with boiling water and stir until completely dissolved. Stir in ice water then slowly pour gelatin mixture evenly over cake. Cover cake and refrigerate until cool. Ice cake with cool whip then sprinkle evenly with coconut. My favorite Dolly Madison cake. Will have to try looks good and easy. Like your new page design. This was a big hit at our house! We made it for when friends visited and their son had 3 pieces! So cute! It was delicious! I made this for my mom's birthday yesterday. It was a big hit. Light and very flavorful. Next time I might try incorporating some of the coconut into the cake as well. Thanks for the great dessert! Is there a good alternative for the coconut?? You can leave it off if you'd like. I don't think it would be nearly as good without coconut!! No mistake. This is a white cake mix (not vanilla or golden). You use whites only to keep the cake white in color. Can you use any white cake mix or does it have to be one without pudding in the mix? I'm very happy to see this cake - My mom loved Lucy's Raspberry Zingers when I was a kid (I liked Charlie Brown's chocolate ones. Or maybe that was Snoopy) Anyway, her birthday is about 2 weeks after Christmas making it difficult to have a great cake that is sweet but not heavy like all the ones we probably ate during the holidays. This year - I'm making THIS one. She will be 77 in January and will be thrilled to share it with her Old Lady Posse during their game night! Making this for thanksgiving. Cant wait to eat it! I used yellow cake mix, whole eggs, butter rather than oil and cream in place of water or milk...made it very moist and wonderful!!!! I just wanna say thank you for sharing the content and wish you all the best for your website and your whole team.